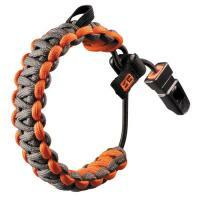 The Gerber Bear Grylls Survival Bracelet is a multi-purpose piece of outdoor equipment, designed in partnership with the famous British survival trainer and former Special Forces officer. It is made from 12 feet of braided high tensile strength paracord, a versatile material that can be used to hold together a shelter, secure a splint, hang food out of the reach of wild animals, or even build a makeshift bow. Its one-handed cinch secures it tightly around the wrist for easy portability and access. Attached to the closure is a loud emergency whistle for summoning help in dangerous situations.